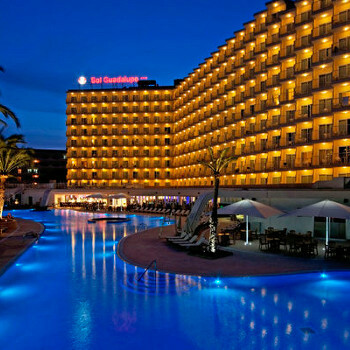 The best hotel in Magaluf for families. If you are looking for a lovely massive clean pool, friendly staff, a clean environment and a relaxing holiday when you’re not up the strip that is the Sol Guadeloupe is the hotel for you. This hotel is in a great location 4 mins walking from the beach and 5 mins walk on to the strip if you fancy the nightlife. The food was excellent always something to eat for the children. Entertainment is like most hotels with nightly shows and bingo something for the adults and children. In the day they do have children's activities going on darts, volleyball, water carpet which our children enjoyed very much. The entertainment staff and lifeguards are great and do not pester you if you don't want to join in either. They are very strict around the pool area no inflatables are allowed in the main pool only the children’s and indoor, but the main pool has a lovely big Jacuzzi in the middle. Our room at the front of the hotel had a lovely view over the pool and the sea. Rooms were very clean with a nice flat screen TV with English channels so if you want to watch Coronation Street over there you can. The Beer in the Hotel was lovely as were the cocktails. All in all a fab enjoyable hotel where I definitely would go back again, everyone single one of us enjoyed the holiday and did not here any complaints from other guests either. This hotel is great for those who wish to be in walking distance to the nightlife but not right in the heart of it where all the 18 year olds stay. You can go back to your hotel and not here the constant boom boom boom all night like you do further up the road. This hotel is great for choice. The hotel is very modern,clean and bright. The food is good as they cater for many nationalities, all staff are friendly and helpful rooms are cleaned daily, and would recommend this hotel to anyone and would stay in this hotel myself again. Great hotel. Hi just got back from this hotel on the 21st july. Reception is very modern and clean. We were greeted by two lovely smiling staff which having stayed in many hotels was surprised because most we have encountered have been miserable. We had 3 rooms booked and 1 of our rooms was on a different floor but we said we preferred to be all on one floor and this was quickly sorted. There are 4 lifts again lovely and clean and very quick. We were all on the 8th floor with rooms overlooking an apartment block (sol y mar)but also a lovely view of the sea. The sol y mar take bookings for big groups and although they could be quite noisy it is magaluf and theyre there to enjoy themselves and once our patio door was shut you couldnt really hear anything. The rooms are nicely furnished and there is a television but it only has bbc1 and news channels in english. The bathrooms are bright and clean, powerful hairdryer and a powerful shower although getting the water temp right is impossible and it goes from scalding you to freezing in seconds. This hotel though seriously lacks souund proofing. You can hear everything that goes on in the rooms either side of you and above and below. You can hear people brushing their teeth in the bathroom its that bad and you couldnt have a private conversation unless you whispered. Restaurant: The restaurant is a good size and very clean and modern and at busy times you were shown to a table. The breakfasts were excellent. Full english, omelettes to order, ham,cheese, cereals, yoghurts, fresh bread, buns croissants, jams,cakes doughnuts, tea, coffee, hot chocolate, juice and water. We found the evening meal to be a bit of a let down although there seemed to be plenty of choice the quality of the meat wasnt always that good and food could be quite repetitive but we didnt starve. Pool: there are 3 pools the main one which is massive and two childrens pools around the corner. We never had problems getting a sunbed although we did put our towels down on our way to breakfast at 9.30am which seemed to be the norm for most people but there was no stampede at daft o clock in the morning for a bed like in some places. Entertainment: the entertainment team are brilliant. There is a kids club where the younger ones are kept occupied all day and there were games around the main pool for anyone that wanted to join in. At night they put different shows on, Grease, A western night, a horror night, bingo for those who cant live without it. Something different every night and all to a high standard. The drinks in the hotel are also reasonably priced although slightly dearer than some places in the resort but you are getting entertainment. There is a small arcade in the hotel and on the first floor they have a laundry and a baby room containing steralisors, kettles ,fridge, microwave where you can make up your babies bottles ect. The hotel is about a five minute walk from the beach and the same to BCM square and a further couple of minutes to the strip and a 15 minute walk to palma nova. There are bars across the road from the hotel, manos, spikes, green parrot popeyes to name but a few. The staff in this hotel are fantastic every single one of them and make your stay very enjoyable and they work very long hours. We didnt like the resort so we wont be returning to this hotel but if anyone is thinking of going to magaluf id say book this hotel. What a fantastic hotel.starting with a very impressive reception area and massive lounge,which houses an arcade area,which leads into the resteraunt(WOW).i have read some people say the quality of some food was not as good as it could have been,i was at hotel the same period as some of these,and i can tell everyone,for the 14 nights i was there,i could not fault a single item in the resteraunt,and the choice was endless.there are 4 pools at the hotel,and though bed reserving not allowed,i watched from my balcony each morning from 8,people putting towels on up to 8 beds,even as the attendants were arranging them,and noticed some of these beds being unused for hours.the only fault i found was the construction of the rooms,you can hear a pin drop from the other end of hotel. This is the best holiday i ever went. The hotel is fabolous. I have now been 5 times and i love it. The staf are great and very friendly, also the food, cleanliness and location are outstanding. The shows at night are very good, eeryone i know enjoys them. Especially kids. I honestly couldnt fault anything! The refurb is wonderful, made a good job. Everything is a very high standard. Just back from a fantastic week in the hotel. Travelled on the 16th June and had a fab time. The hotel which has been very much upgraded is lovely. Cleaned from top to bottom every day. The staff we met were friendly and always said hello or good morning. The hotel was in a perfect location as it was away from the main bar area of Magalluf yet it had its own little strip of bars just across the road. Entertainment within the hotel was good, during the day was plenty of activities to takle part in. Didn't see any entertainment in the hotel at night, but it was very good from what we heard about the shows. We are returning to Magaluf and the same hotel again in September/October. Second time here and it was even better than before , the hotel has had a mega make over on the ground floor and the pool area , grand designs on a large scale. Everything about this hotel is excellent and will definately be making a third visit later this year.